In a packaged unit air conditioning system the compressor, condenser, and evaporator are all located in one self contained unit, which usually is located on the ground or a roof top. Package air conditioners are normally used for mobile homes, homes on a crawl space, and residential and commercial roof tops. Supply and return air ducts come from indoors through the home's exterior wall or roof to connect with the package air conditioner system, which is usually located outdoors. Packaged air conditioners often include electric heating coils or a natural gas furnace. The most popular versions are package units for air conditioning only, air conditioning heat pumps, electric heat (for mild winter climates) and gas heat package units. This combination of an air conditioner and central heating eliminates the need for a separate furnace indoors. Mildest winter climates - (South Florida, south Texas, etc.) Air conditioning package units with electric heat are normally the best choice. Where the heating season is very limited and little operation time is required for the heating side, electric heat can be a cost effective choice. Package air conditioners provide the ability to add an electric heating element for just a little more money without modifications of any kind. 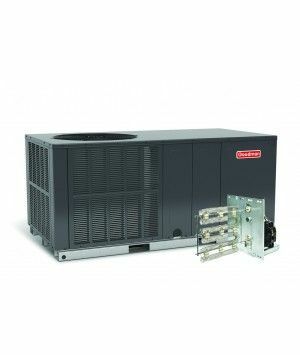 Mild to moderate winter climates (Southern regions and climates where the low temperature rarely drops below 20 degrees Fahrenheit) - A heat pump package unit air conditioner is normally the most cost effective choice for these applications. Using an energy efficiency compressor to transfer heat from the ambient air to the indoors and a supplemental heating element for backup, these systems are very common throughout the country. Cold winter climates (Northern regions) Package unit heat pumps and gas heat package units are the two choices for colder regions. In the coldest climates, gas heat is the best choice.